What has you on the fence? Do you have concerns? I joined the forum but then got distracted for a bit and forgot about it. I've just started getting annoying freezing problems with the game and it's not in the middle of a marathon session. It happens at the intro screen after connecting to the EA Server...it happened four times in a row upon starting the game! Once I prevented the game from connecting to the EA Server, the game seemed to work just fine. I had a similar problem with NHL 12 on the PS3. I think it's an EA thing with trying to connect your user name to their server, etc. Once I disabled online, it worked fine. I have not had any problems with online for Madden on the WiiU though. Have you guys checked out the Connected Careers website yet? I tried to....but I seem to have forgotten my password. I think I had it reset, or something, and it gave me a stinky one. Confusing, because I'm obviously logged in on the Wii U, and I don't remember entering "521idb4db" or something. I just logged into there for the first time but I'm only apart of one online league where it hasn't started yet so the site isn't really useful yet. Looks like it's going to be pretty cool! Were you able to actually get on and tinker with stuff? I got to the "choose a league" or Platform? screen (remembered my password), and I can't advance at all. Using Firefox (THANKS A LOT, FIREFOX). What did you do? What browser? Maybe I can try AWESOME INTERNET EXPLORER at home. I'm actually using Firefox, haha. Just found out how to put players on the trading block and release them! NO! Why won't it work for meee?! and the "Select Account" banner, what do you do? On my screen, I can only see the tippy top of the Wii U letter because F'n PS3 and 360's HUGE F'ING BOXES are pushing it out of frame, and I can't scroll down. What do I dooooo? EDIT AGAIN - UGH, I had an awesome idea and it worked. I had to "Zoom Out" under my View Tab, and it worked. THANKS A LOT, FIREFOXBALLS. --Haha, "Chan Gailey - 150." Tied with the guy that The Blind Side is based on. I wonder if I want to fire him and put myself there. Will it give me long hair? I want my awesome beard out there. AND A HAT. HA!!! "Throw less than 10 INTs - End the season throwing no more than ten interceptions. 1000XP" NOPE. TheBigG told me today via PM that he'll also be playing over on Hobbs' site. YES!! Seriously. I'm 7 games into my offline career and I've thrown 20 INTs. 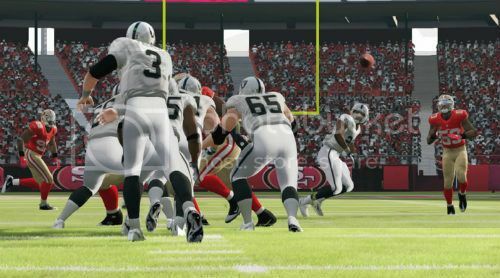 That is on pro, with the CPU INT slider turned down to 30 or so after the first few games. It's helped a little but not much. I signed up on Hobbs site too. My career is in the shitter. Hey, you guys should start getting some reps on All-Pro! And 6 minute things! I don't know if Hobbs invited you guys directly yet (his old HMFL Vets get preferntial treatment, sorry! ), but he has a FANTASY DRAFT league in the works, too. Not sure if that stuff would interest you in addition to the SIM league. And I gotta do that GameFace stuff today. GOTTA. My face is awesome. I can't wait for Tiger Woods. Yessssssss. Lets play some F'n hockey, too (you know..when it comes back). PLAYOFF BEARD -- YEAR ROUND.